I am currently go to Ivy Tech Community College. i have two children both boys. I love to read, spend time outdoors, listen to music. the kids say I am cool because I listen to the same music as they do. I am currently working at Bradford Woods in the kitchen. I am single. I am going to school to get a business administration degree. I am really enjoying going back to school. I was in Orchestra but all my friends were in band.During football games I would help everyone get ready and then they would hand me their coats to carry to the bleachers so they could stay warm. I dont think I paid to get in any game because I came in with the band. good times. Leslie Asher sargent has a birthday today. 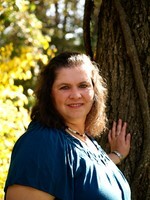 Leslie Asher sargent updated her profile. View. Leslie Asher sargent changed her profile picture.